A lot of our customers are already very familiar with hot fudge from Coop's MicroCreamery, with its chocolate-hued drippy-wax lid and unusually thick, molasses-based (corn-syrup-free) recipe. Now producer Marc Cooper has just created his new delicious sauce - salted caramel, crafted in collaboration with Hyde Park-based confectioner McCrea's Candies. 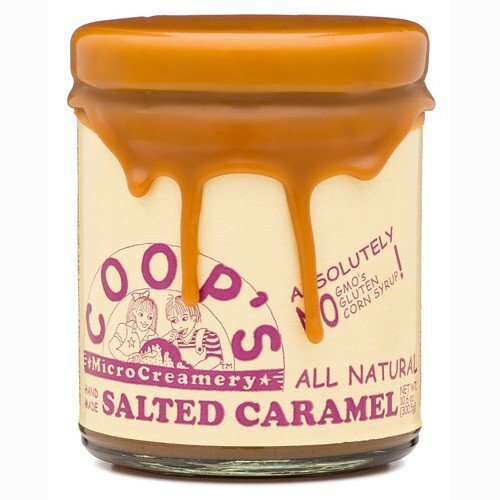 Made with cream from New Hampshire's Hatchland Farm, butter from Cabot, and- to keep it all from separating in the jar- an allergen-free, sunflower-based stabilizer imported from Spain, it features Coop's signature lid topper, rendered in glossy caramel. Amazing on almost every dessert we've tried so far, but especially ice cream and pies. 2015 sofi gold winning product. All Natural with NO GMO's, NO Corn Syrup, NO Gluten.